KORA: What is the inspiration behind your latest creation? MIRANDA: I wanted a truly nourishing eye treatment that could make me look like I’d had a full 8 hours of rest when possibly I haven’t! Because the skin around the eye is thinner than that of our face, I wanted a product that specifically targeted this area. The inspiration behind it was to look refreshed every morning, no matter what—which I think is what most people are looking for in an eye treatment. KORA: Why did you create an eye oil and not a cream based product? MIRANDA: The team and I chose highly active Certified Organic oils and extracts which are known for their deeply nourishing and replenishing properties. I wanted a product that would be absorbed quickly into the skin around the eye area and was easy to apply. I was very specific in what I wanted—I went back and forth with the labs many times and tried & tested numerous formulations before I was fully satisfied. I am so excited and proud of the results this product achieves. KORA: Can you talk us through some of the ingredients you chose? Kahai Oil—A natural retinol that improves elasticity and smooths out fine lines and crow’s feet. Coffee Seed Oil—Added for its ability to awaken the skin and reduce puffiness, while revitalizing the skin’s circulation. Tomato Fruit—A rich extract known to brighten the skin around the eye and reduce the appearance of redness and inflammation. Marine Bamboo Extract—The firming capabilities of this extract helps to strengthen the elasticity of the skin in order to improve the appearance of fine lines. Noni Fruit Extract—A rich source of over 100 vitamins, minerals, and antioxidants that support the skins natural radiance. KORA: What is the significance of the Rose Quartz rollerball? MIRANDA: It was something extra special I wanted to add to the product. 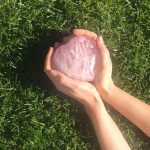 I’ve always been a believer in the power of crystals—this is why all of our products are filtered through Rose Quartz during the manufacturing process. The Rose Quartz rollerball was an extra way to boost the vibration of self-love while providing a soothing experience. Cleopatra and ancient Egyptians were known to use Rose Quartz for its beauty and healing benefits, such as clearing the complexion and preventing wrinkles. KORA: How do we incorporate it into our morning & night routine? 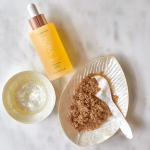 MIRANDA: In the morning, I apply it after I cleanse, mist & moisturize, and before applying the Noni Glow Face Oil combined with my Hydrating Moisturizer. At night I double cleanse first with the Cream Cleanser and then with the Foaming Cleanser, mist with the Calming Lavender Mist. 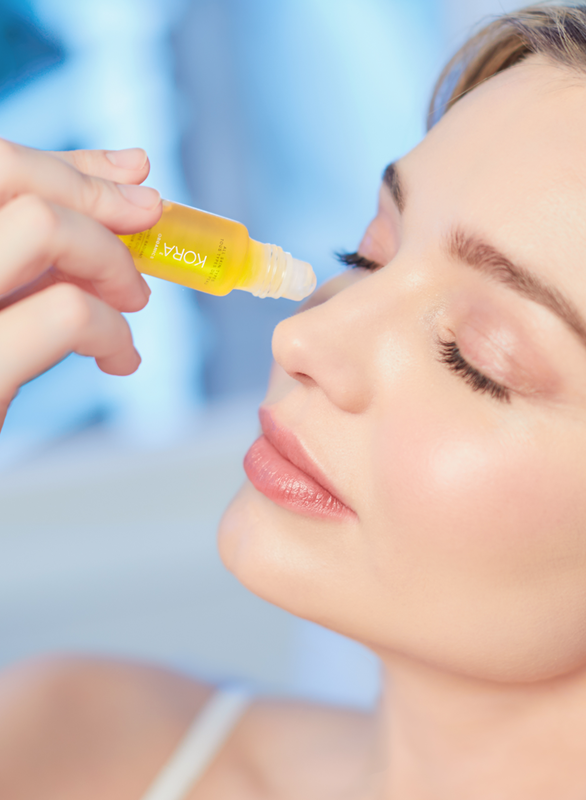 I then apply the Noni Glow Face Oil and the new Noni Radiant Eye Oil followed by the Soothing or Hydrating Moisturizer depending on how my skin is feeling. 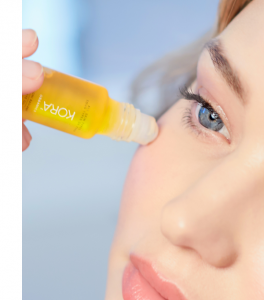 KORA: Who is this eye oil suitable for? MIRANDA: We created this oil for all skin types, all ages, and for both males and females. If you’re younger you can use it as a preventative measure, for more mature skin it can help reduce the appearance of fine lines. Based on an independent consumer use study of 31 women, ages 36–50 using Noni Radiant Eye Oil 10mL twice daily over a 4-week period. I hope you love our new product as much as I do. I’m obsessed!